Michael Dell is a business tycoon who has a lot of investments in a number of ventures, however, he is most popular as the founder of Dell Computer Corporation now known as Dell Technologies. Dell is one of the leaders in the manufacturing and distribution of personal computers (PCs) all over the world. Coming from a business-oriented family, it was natural for Michael to follow the business path. With his interest in technology, he dropped out of college to pursue his dreams of being a PC manufacturer. His dreams paid off as he is listed as one of the richest men in the world today with a net worth of over $25 billion. He was born Michael Saul Dell on 23rd February 1965 into a Jewish family. Michael Dell’s birthplace is Houston, Texas and he was born to a dentist father, Alexander and a stockbroker mother, Lorraine Charlotte. His is a family of four, with his brother who is Adam R. Dell. Michael attended the Herod Elementary School, The Memorial High School and The University of Texas at Austin for his primary, high school and college educations respectively. Dell grew up listening to his mum talk about economic and business affairs and being an intelligent and smart boy, he picked interest in economics and business as a teenager. His entrepreneurial acumen led him to sell stamp collections and subscriptions at the Houston Post earning a huge sum of $18,000 which was a huge some at this young age. Away from what kids his age will do with such amount of money, Michael invested in stocks and precious metals. At the age of 15, he developed an interest in computers. He dissembled his first computer in order to learn how it works. Years later, while studying to be a physician at the university, he began an informal business of purchasing, upgrading, assembling and selling IBM personal computers from his apartment. Dell was making over $80,000 with his customer base made up of mostly students on campus. He would later establish a company providing a similar service of taking computer orders over the telephone and selling them to customers. Michael Dell’s interest in computer business was further fueled when he attended the National Computer Conference, where he met and discussed with computer business experts to understand the modus operandi of the industry while at the university. His passion would result in his dropping out of college in 1984 to pursue his business squarely, which led to the establishment and registration of a PC company with the name PC’s Limited in January 1984 in Austin, Texas. The company was renamed to Dell Computer Corporations in 1987 and was separated from a two bedroom apartment. At that time, the company made huge amounts of profit by selling computers, upgrade kits and add-on components and continued to soar as the years progressed. It thrived on Dell’s belief that he could provide PCs at lower prices to customers directly while providing unbeatable technical services. In 1991, the company began manufacturing and selling its own personal computers when it moved into a 30,000 square foot condominium. His marketing strategies were founded on providing high-quality products and treating customers as kings. These tactics yielded tremendous results as the young company in no time led the list of Fortune 500 Companies – a prestigious list of the largest American companies with earnings of over $6 million annually. Dell Inc. went public in 1988 with its initial public offering rising to $30 billion. Like most successful entrepreneurs, where others saw closed doors, he saw open doors and opportunities. At a time where many of his competitors looked away from online commerce, Dell saw the need for an online presence early and launched his company’s website in 1994 and by 1996, the company began making online sales up to the tune of $1 million per day which later rose to $50 million each day. Michael Dell is also credited for creating a less complex computer design with an improved microprocessor. Michael Dell is currently the CEO and Chairman of Dell Inc. who has received awards for his achievements such as the CEO of the Year by Financial World in 1993, Industry Week in 1998 and by Chief Executive in 2001, among other awards. 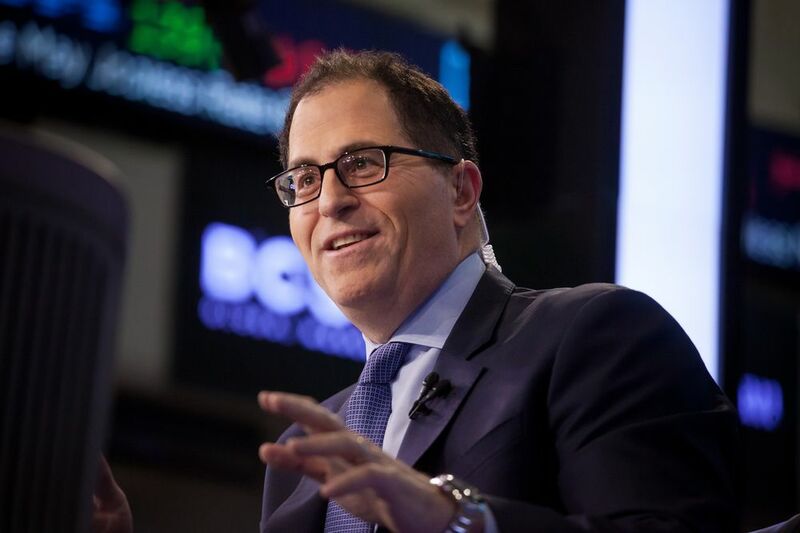 Dell is also known for his philanthropy; he founded the Michael and Susan Dell Foundation in 1999 which provides education, health care and financial stability for a wide number of people. Michael Dell has carved a niche in the computer manufacturing and sales industry. He has several achievements accredited to him. As of 2013, he had a monthly salary of $13 million and was estimated to worth $15.3 billion. As the years went by, his income increased astronomically and by a recent estimation (2018), he was said to be worth $28.6 billion making him the 39th richest man in the world. Dell is happily married to his soulmate, Susan Lynn Lieberman since they tied the knot in October 1989. The couple met on a blind date and were instantly love struck. Susan was impressed with his simple nature and decided to date him. She is a popular fashion designer who has three fashion labels although she closed one in 2009. Their marriage has produced four lovely children: Alexa, Kira, Julietta, and Zachary. The billionaire is known for being very protective of his children. Some of his children followed his footsteps in the area of career choice like Zach who launched the dating app Thread, however, the app is no longer in use. The family lives in Austin, Texas in a 33,000 square foot home nicknamed The Castle due to its hilltop location and the presence of heavy security.